I flew from Saigon to Bangkok on Christmas morning leaving behind a city gone bonkers for the birthday of sweet Baby Jesus (or at least for the consumer trappings that go hand in hand with it) and touching down in one that was going decidedly less so and that was certainly fine by me. Hanging out in Saigon while she was all tarted up in her festive holiday attire was brilliant. But I’d be lying if I said it didn’t also induce a bit of homesickness for Xmas back in the States. My return to Bangkok coincided with my girlfriend Deandra’s arrival which your humble narrator had been eagerly anticipating for quite some time. She would be joining me for a three week run in Thailand. In an interesting twist of flight scheduling and time zone hopping, she took off from LAX on Xmas eve and landed in Bangkok at 1 am on the 26th thus spending the entirety of Xmas itself lost in transit. Since I hadn’t had much of a festive yuletide either, we vowed to make up for it in the days to come. 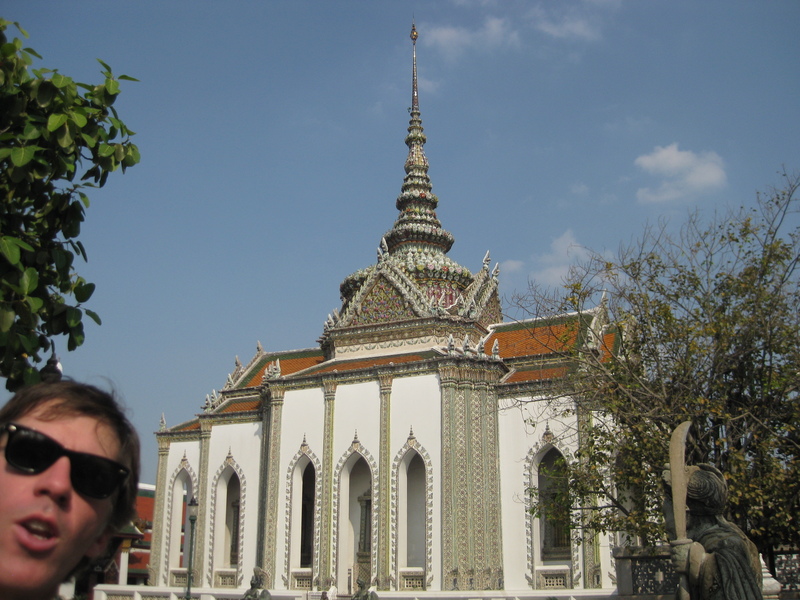 Unfortunately we must have forgotten that vow when we decided to kick off her visit with a bit of touristy sightseeing on our first day together at the Wat Phra Kaew and Grand Palace. We bid Bangkok adieu (for the time being) after a couple of days and headed north to Chiang Mai via a longer than anticipated train ride. The sleeper cars on the night trains (which are the preferred means of travel for most heading north to Chiang Mai) were sold out by the time we bought tickets and so we opted for the daytime run instead thinking at least we’d be able to enjoy the views, right? Unfortunately the window beside our seats appeared to have been washed with a muddy rag dipped in chocolate milk and then squeegeed with a melting Fudgsicle and thus the views weren’t quite what they could have been. It was a pleasant enough ride nonetheless as the scenery for stretches was interesting even through the prism of a Yoo-Hoo window. Unfortunately it was dark by the time we began our final approach into Chiang Mai and thus we didn’t get to see what are supposedly some beautiful landscapes in the countryside around the city. Although I had enjoyed my time there back in October, Chiang Mai wasn’t the most impressive of cities to me the first time around. And with a plague of holiday tourists having now descended upon the town (and yes… we’re both guilty as charged of being part of that plague), it was even less so for my second visit in less than a few months. In particular, the Sunday night market which had made for a fine time pre-high season was a complete and total goat rope due to what must have been at least a fivefold increase in the amount of foot traffic versus my first visit. Logjammin’ aside, we still managed to have a few very tasty snacks at the market and one of us came away with a wisely purchased wooden frog which croaked rather heartily when you ran a little stick over its back. And who doesn’t need one of those? It’s not that there’s anything wrong with Chiang Mai. There are certainly some cool things to do and it’s a pleasant enough place to hang out as long as you’re cool doing so with loads of other tourists, a surprisingly visible portion of whom seem to be 50-something men with pot bellies, poor fashion sense and a hankering for bar girls. But I saw no evidence of what it was that made certain people claim to have fallen in love with the city. It just seemed OK to me and I believe Deandra would agree. Perhaps we didn’t make enough of an effort to escape the Old City? 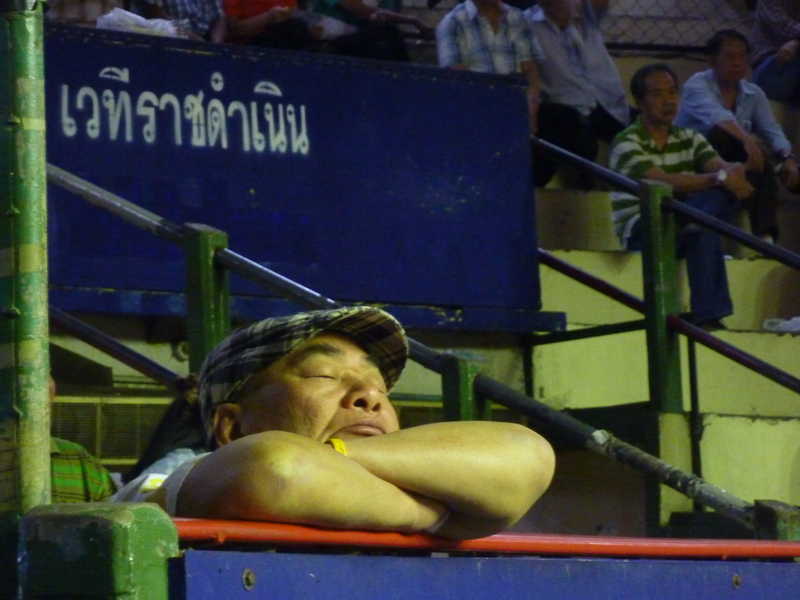 Despite not being bowled over by Chiang Mai, we had a high time of it there anyhow. We ate well and cheaply at Aroon Rai more than a few times. 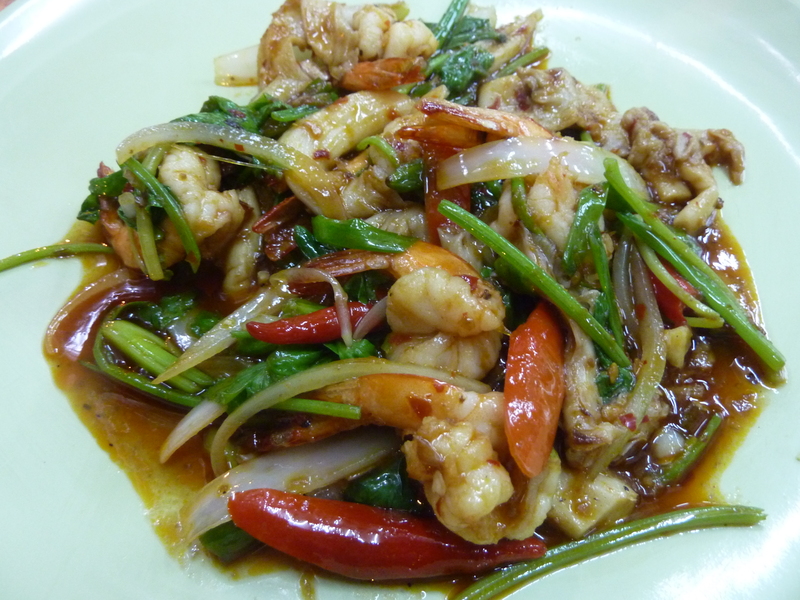 Unfortunately we also ate unwell and uncheaply at the highly recommended Huen Phen. 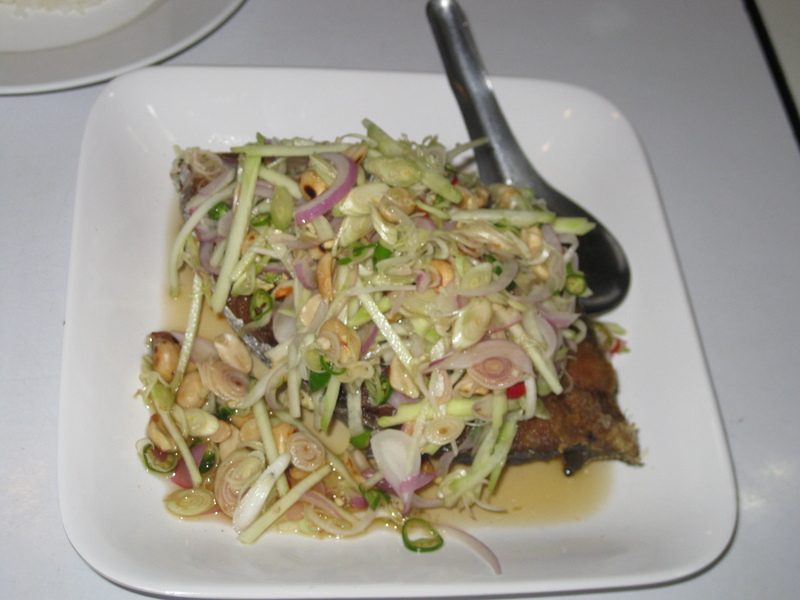 It was the most expensive meal we had in Chiang Mai and far and away the worst. Wha’ happened? Perhaps we ordered poorly? Why aren’t these more popular in the States? 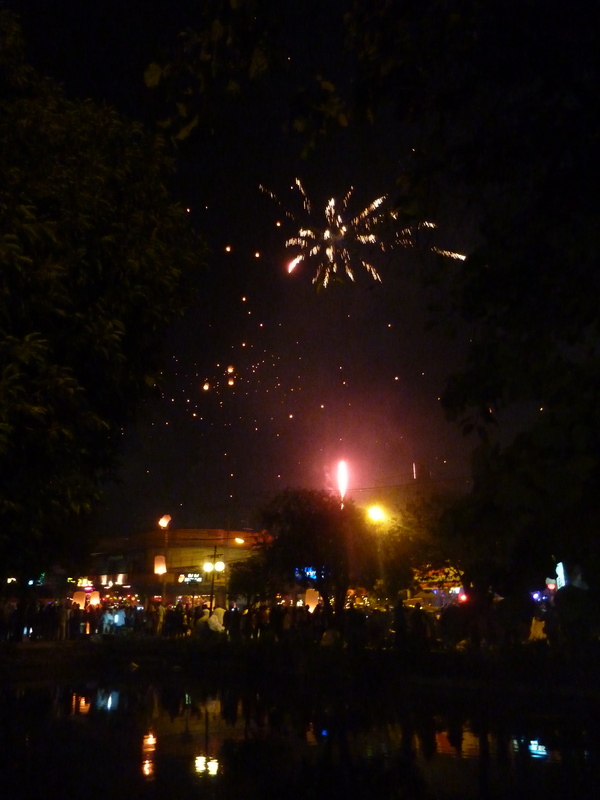 The citizens of Chiang Mai celebrated New Year’s Eve in fine fashion with no shortage of do it yourself, safety be damned firework displays set off in the streets wherever they pleased. It was wonderfully chaotic and made for a refreshing change of pace from the overly ordered official celebrations of firecracker holidays in the States. 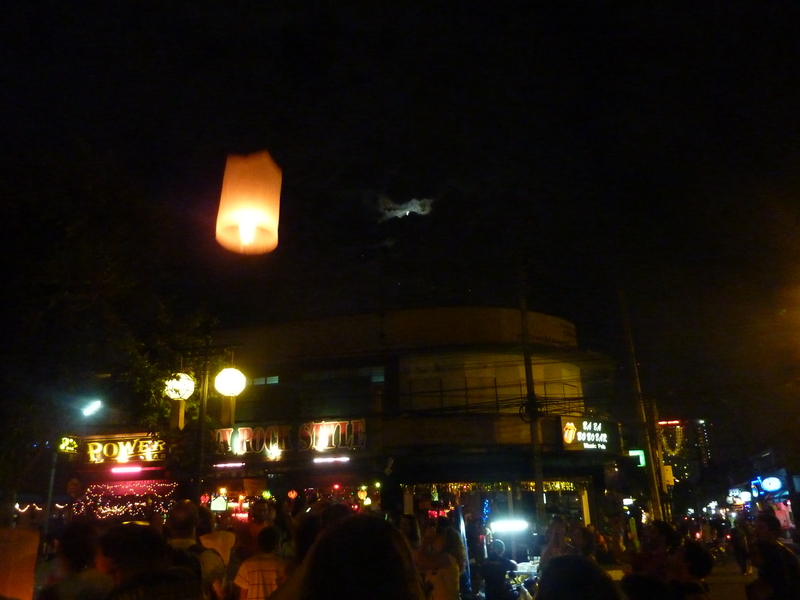 There were also hundreds of floating lanterns (which are kind of like mini hot air balloons) set off throughout the evening which made for a beautiful night sky. 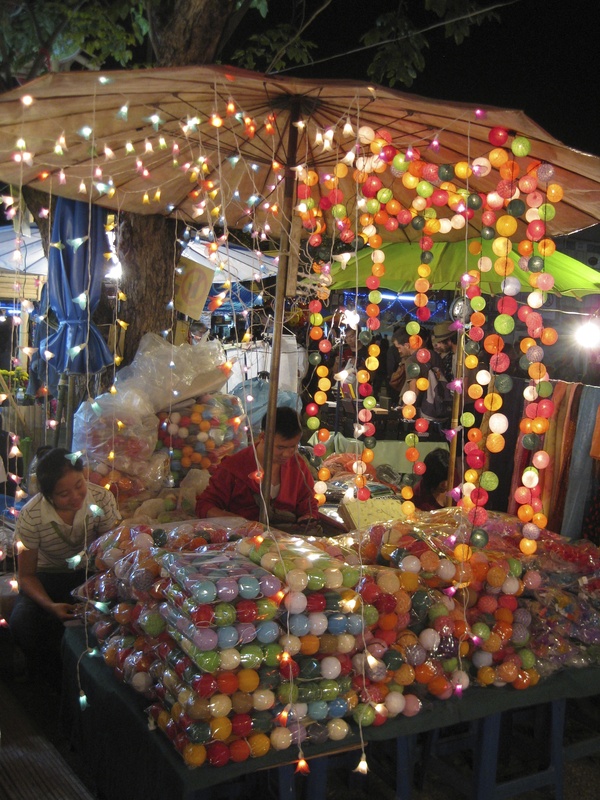 A few locals were doing a brisk business selling them to other locals and tourists alike. Setting one off is supposed to not only bring good luck to the launcher but also carry his or her troubles away. No official word on what it means when one’s lantern gets stuck in a tree shortly after liftoff and burns itself up before the smoldering remains drop into the moat around the Old City which is what happened to a few presumably unlucky and still troubled souls. 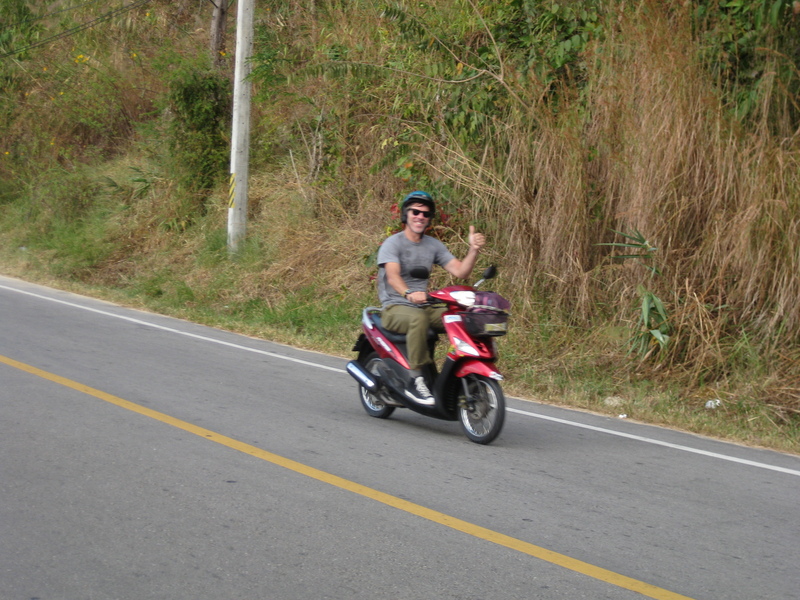 It made for a great day trip out of Chiang Mai. The 100 km loop winds out of the city and up into the forested highlands that surround it. Apparently the Northern Thai used to cultivate poppies in the area but those days are long gone. It’s a bit touristy in stretches but a very fun ride nonetheless. There are snake farms, butterfly farms, reptile farms, orchid farms and virtually any other type of farm at which a tourist might be inclined to part ways with a few baht. There are also botanical gardens and parks and some stellar views. 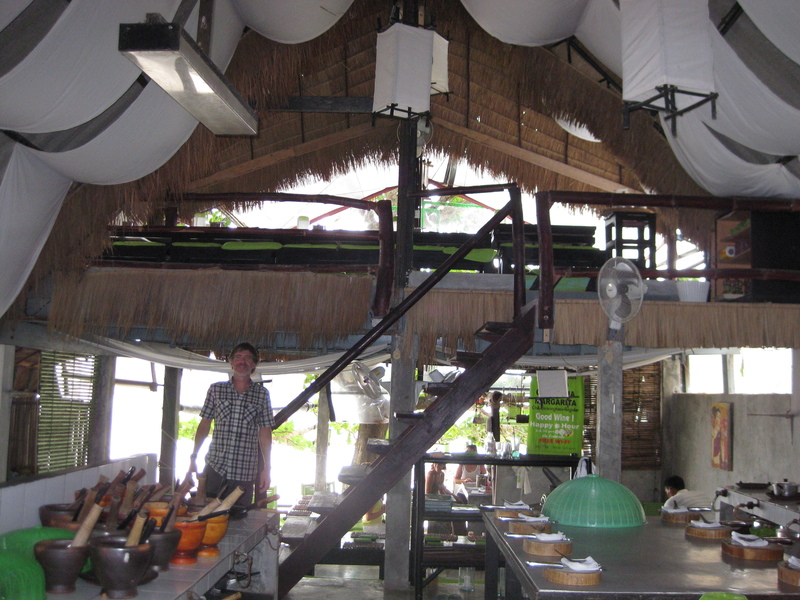 After taking a break at one of the orchid farms, we pulled into an interesting looking restaurant comprised of a few open-air thatched roof huts perched along a small river. 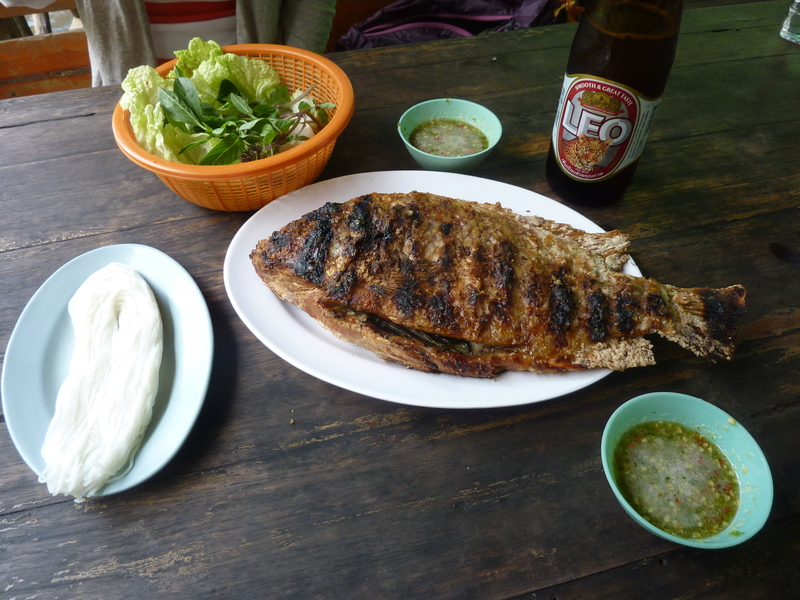 The locals seemed to be all about the fried river fish and bad whiskey poured on the rocks. 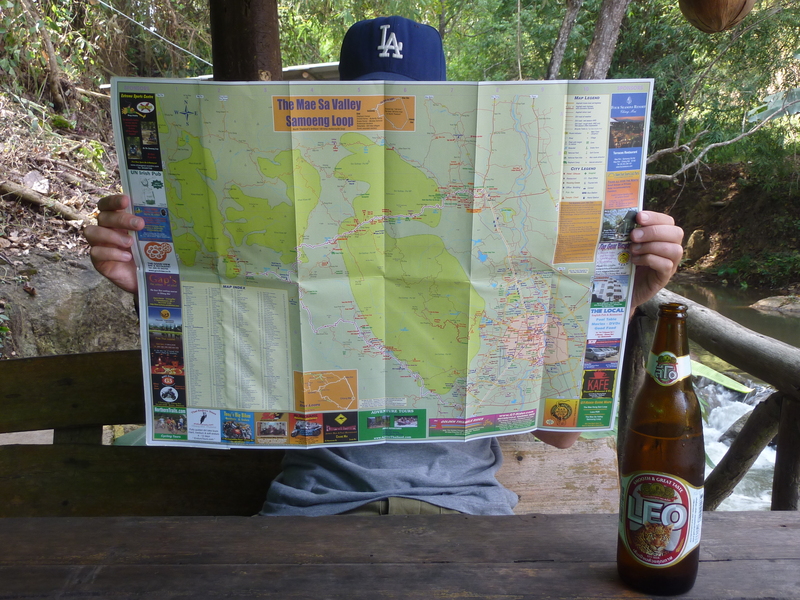 I opted for a cold Leo rather than bad whiskey and took some time to figure out where we were based on our trusty map. The following day we took to the air (plane) and later to the road (car) and finally to the Andaman Sea (ferry) in order to get to the island of Ko Lanta where we would post up for the next week or so. 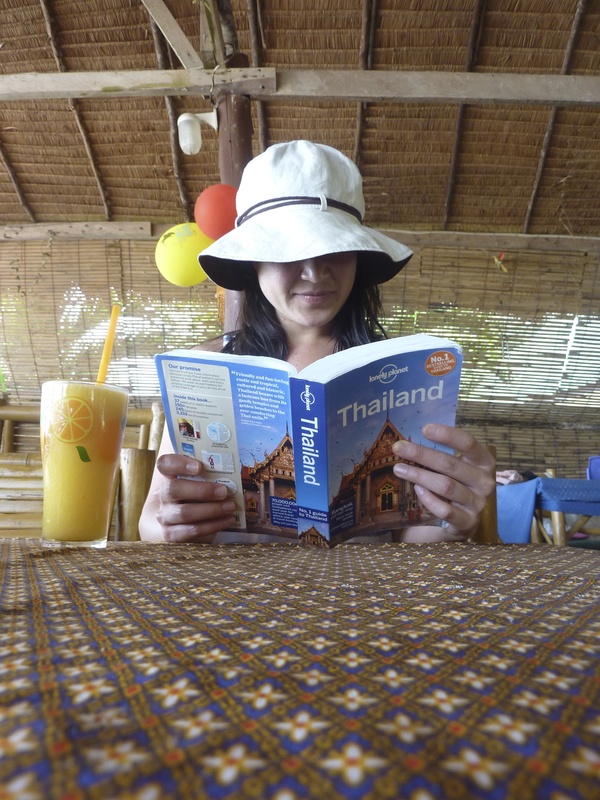 Deciding upon which island or islands to visit for the latter half of our time in Thailand proved to be quite the challenge. Based on what we were able to glean from various travel guides, blogs and first-hand accounts, it seemed that many of the islands on which the Thai reputation for beautiful beaches had initially been built had subsequently been quickly over developed (absent any sort of regulation) and now stood as testaments to the dangers of such development and a tourist industry run amok. Should have been there 20 years ago, man. Should have been there 15 years ago, amigo. Should have been there long before now, dude. 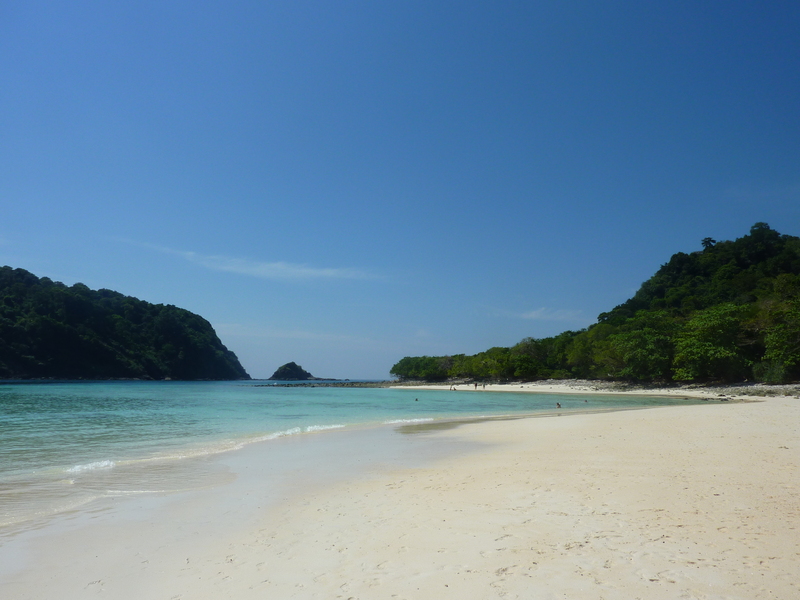 We ultimately settled on Ko Lanta as our first stop due largely to the fact that it was thought to be a bit more low-key and less crowded than certain other islands. It sounded about right as we were looking for quiet sandy beaches with seafood shacks and hammocks rather than Spring Break at Daytona Beach. 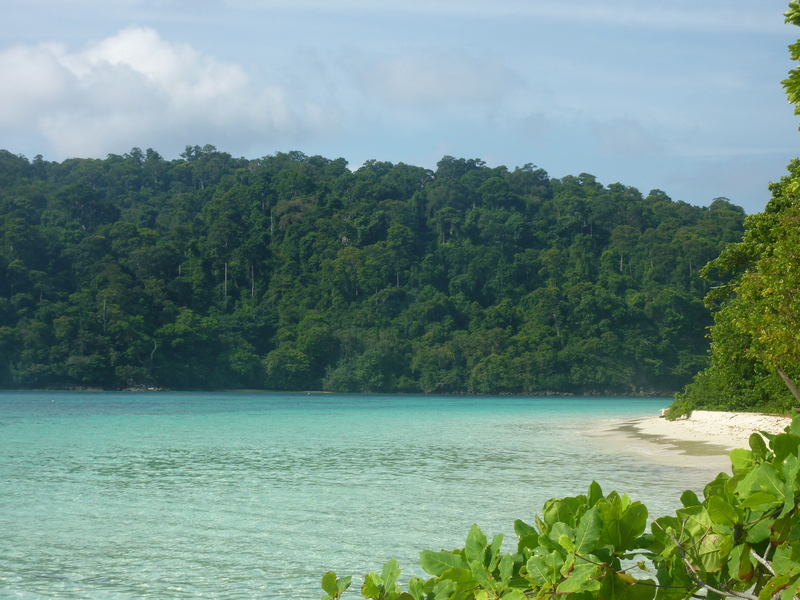 The trade-off was that its beaches were reported to be merely nice rather than spectacular. Our time there basically confirmed those expectations. 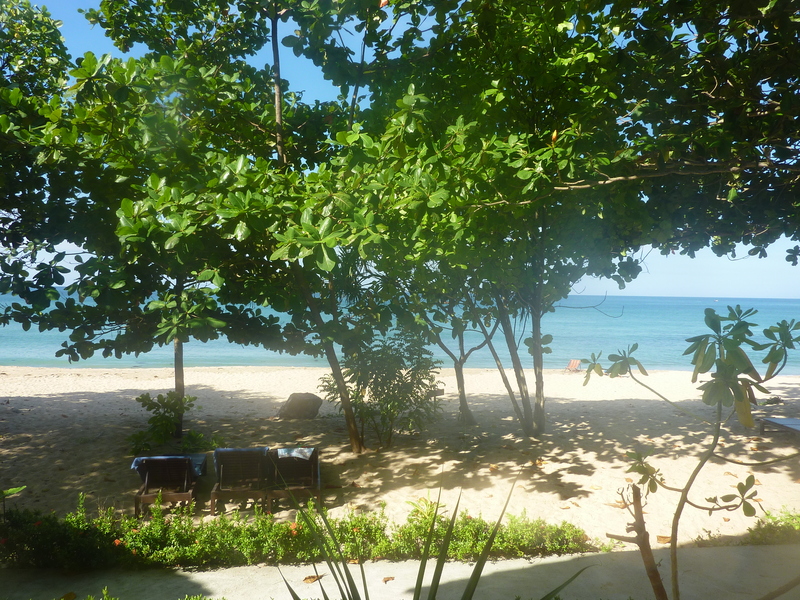 We spent our first few nights on the island in a fantastic small hotel near Klong Dao Beach called the Lanta Mermaid. 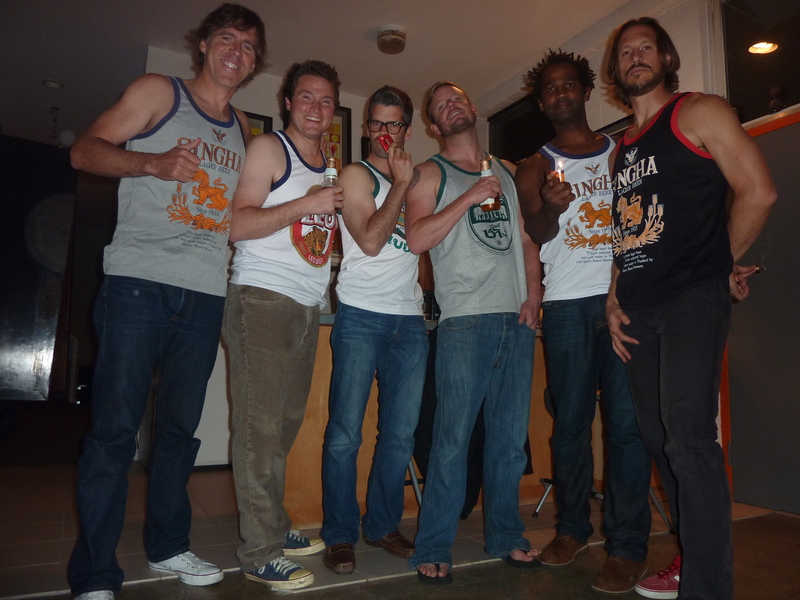 The service was excellent and the owners were great. It was easily the best run hotel we came across in Thailand which probably has something to do with the fact that one of the owners spent some time running a high end hotel in Singapore. 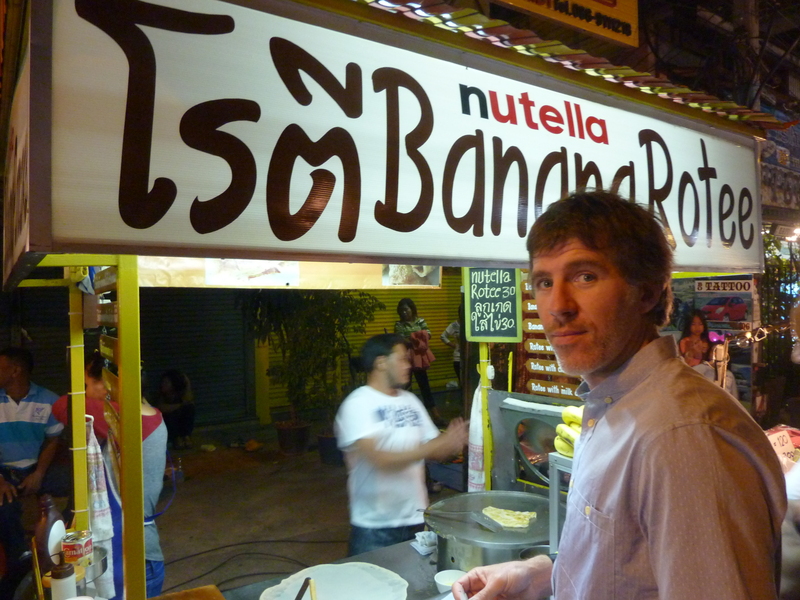 In fact, it was probably the best run business we encountered in Thailand. You might want to check it out if you’re looking for a cheap (at least relative to the rest of the island) and nice place to stay (with a great breakfast included) so long as you don’t mind being across the street from the beach rather than on it. and nights on the beach were nice as well as there is a decent selection of restaurants that set up tables on the sand and serve up fresh seafood. 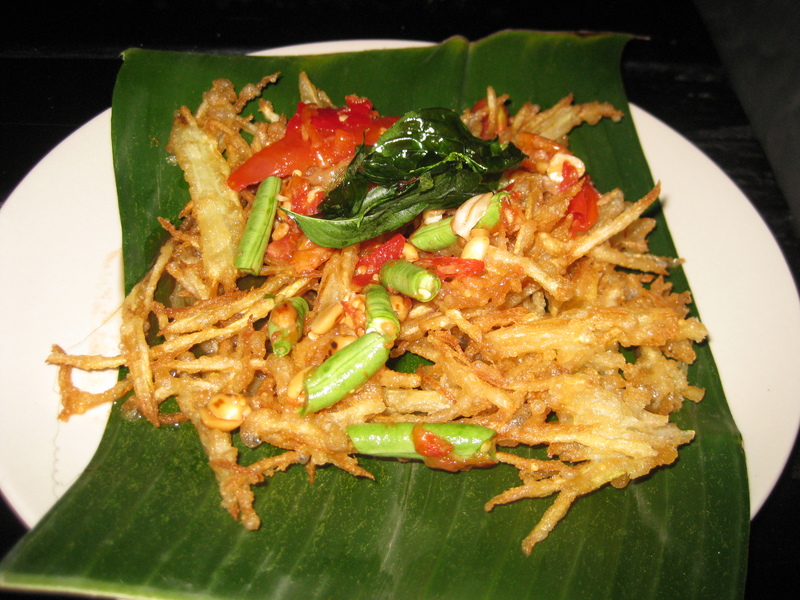 Unfortunately, at these restaurants and virtually everywhere else on the island, the spices have been so dialed down in response to what the delicate European palate supposedly demands (at least as perceived by the Thais running the restaurants), that much of the food tends towards the bland and Thai food has no business finding itself on that side of the flavor spectrum. 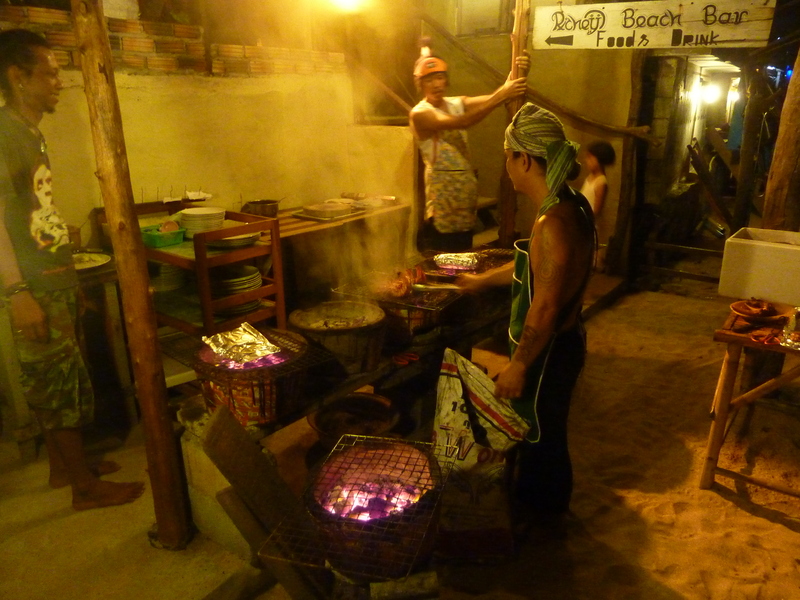 In fact, the only evening on Ko Lanta in which we experienced anything approximating the “real” Thai food we’d had in Bangkok and Chiang Mai was when we cooked it ourselves at Time for Lime, a cooking school with a spacious instructional kitchen arena right on Klong Dao Beach. 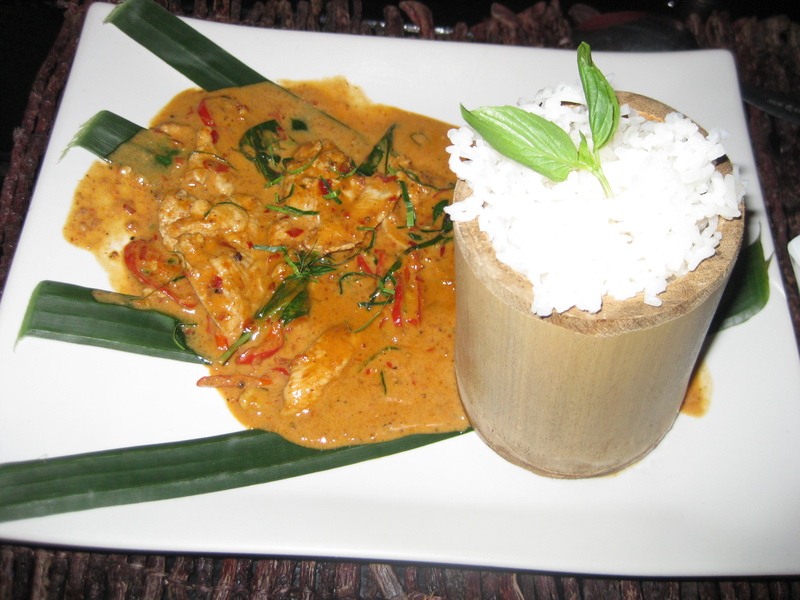 Hot damn I love panang curry! The training at Lanta Gym was great although, at times, a bit more than I bargained for as my 39.5 year old shins were fairly brutalized during my sessions there as was my 39.5 year old neck on one occasion thanks to an over-amped 20.5 year old Dutchman with whom I was paired for what was supposed to be a little light clinch work. For those not in the know, think wrestling while standing and trying to get control of your opponent’s head and neck so that you can tune him up with knees to the solar plexus and face. It’s tiring to say the least and draws upon neck muscles that normally only get used when someone runs into your car from behind while you’re stationary at a red light. Wrenched neck and bruised shins aside, it was great fun and an even greater workout most days. 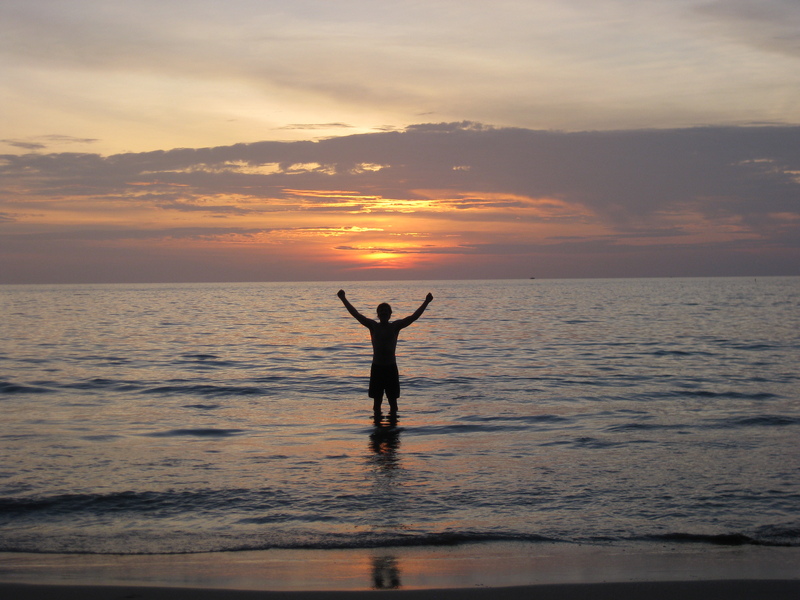 I’d highly recommend posting up in Ko Lanta and training at Lanta Gym should you be looking for a beach vacation/Muay Thai training combo getaway. And if you go, tell their gargantuan Great Dane “sawatdee kop” for me and give him a pat on his giant head. 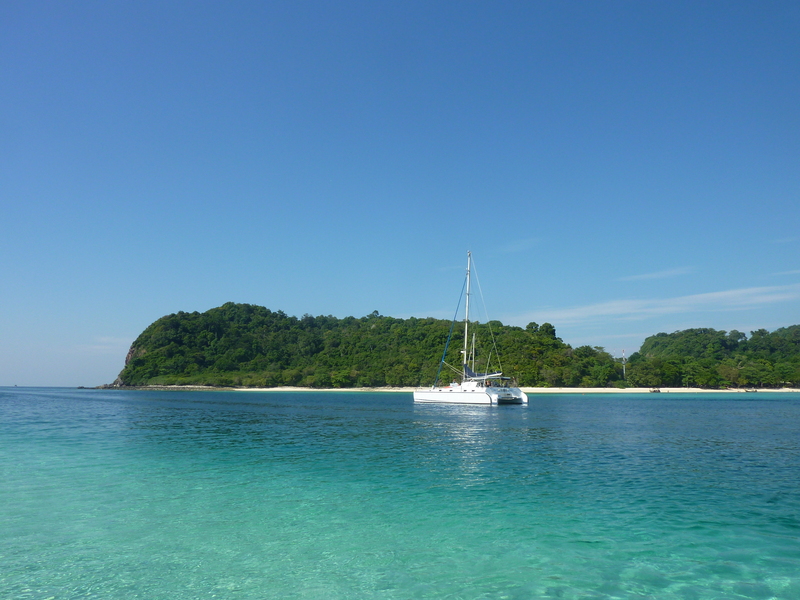 We ventured further afield from our comfortable seaside lodgings one day for the popular Four Islands Tour in which you travel by boat to a couple of quality snorkeling spots and then kick back on a couple of far more photogenic beaches than those on Ko Lanta. We’re talking the aquamarine water and white sand variety – basically the types of beaches you’ve seen in those ultra-appealing photos of the Thai islands that lure travelers down there like moths to an open flame, or like me to a panang curry with a cold Singha riding shotgun. 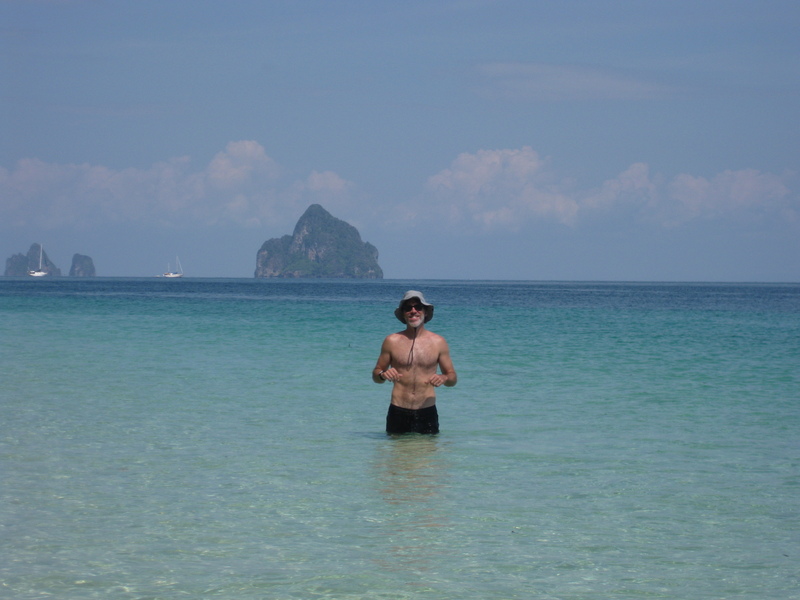 They were definitely the most beautiful beaches and waters we saw in Thailand. And the snorkeling was top notch. 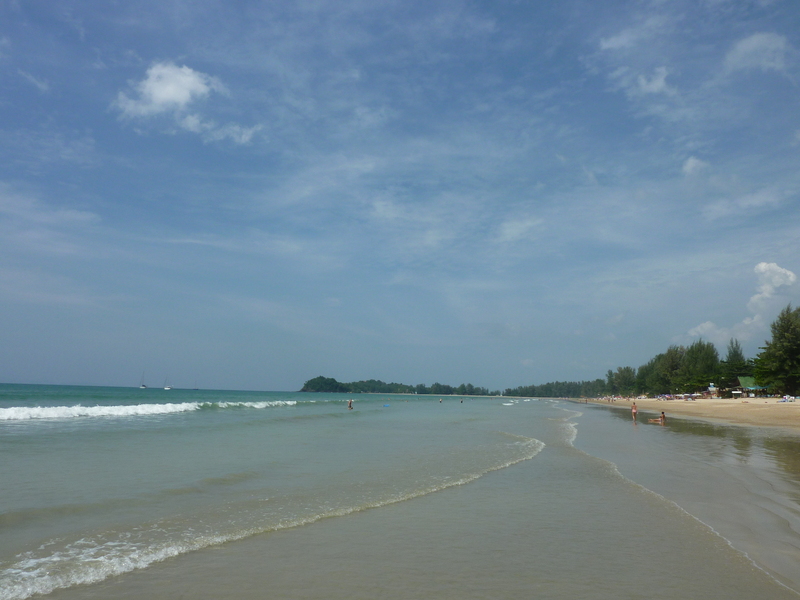 Were we enamored of/in love with/captivated by Ko Lanta and the handful of smaller islands we saw? Not really. 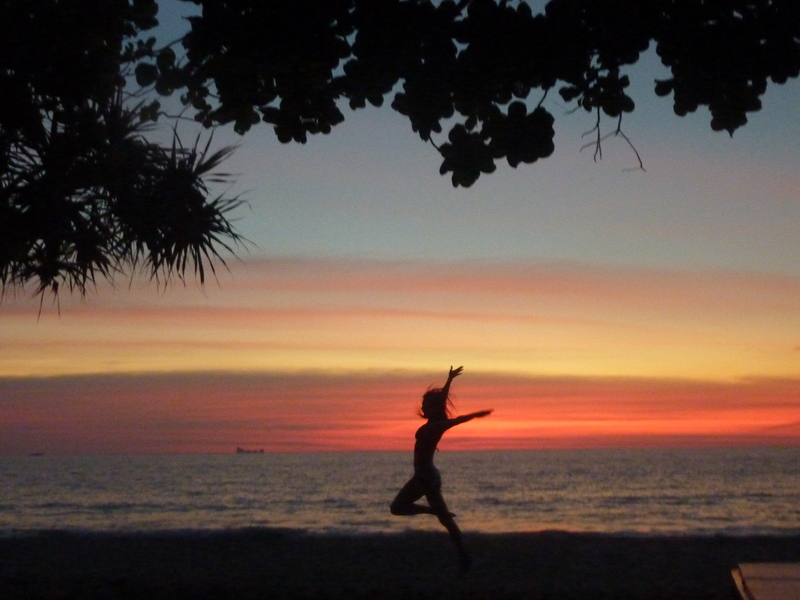 But that’s not to say that we didn’t enjoy our time on Ko Lanta. 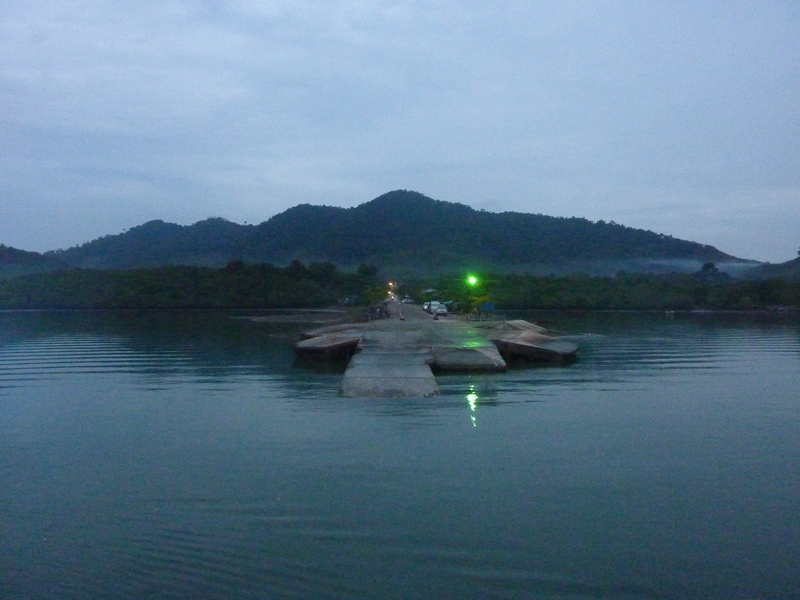 The island was indeed nice and we had a great time. 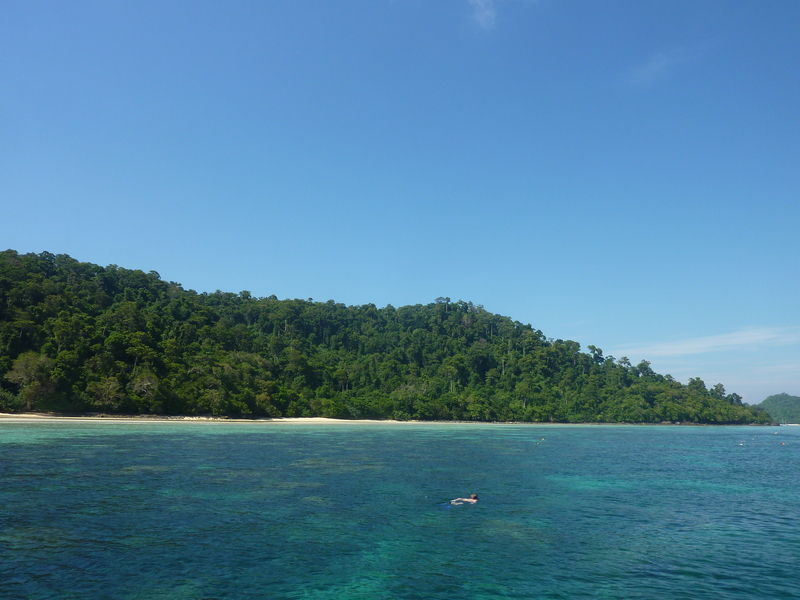 And some of the small islands we saw on our day trip were even more appealing. The sunsets were impressive and the snorkeling around those smaller islands was good. And dinner on the sand every night is hard to beat (even if it’s insufficiently seasoned), as is having access to a quality Muay Thai gym less than a mile from the beach. But neither of us walked away feeling all that impressed with the place. 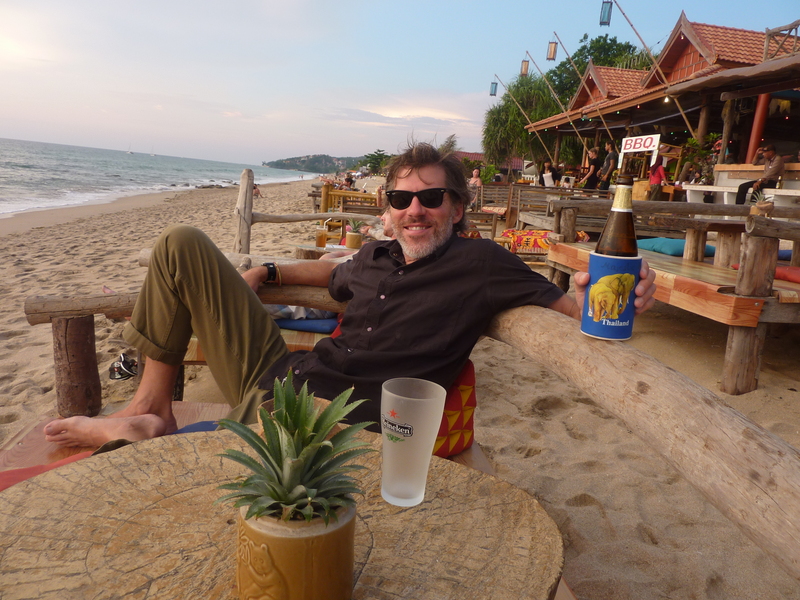 I should mention that hotels and food on the island were more expensive than I had anticipated and I suspect that might have factored in to Ko Lanta’s failure to overly impress your humble narrator. I guess I’d heard one too many stories about the old days and how far a fistful of baht could take you. Nowadays? Not so far. 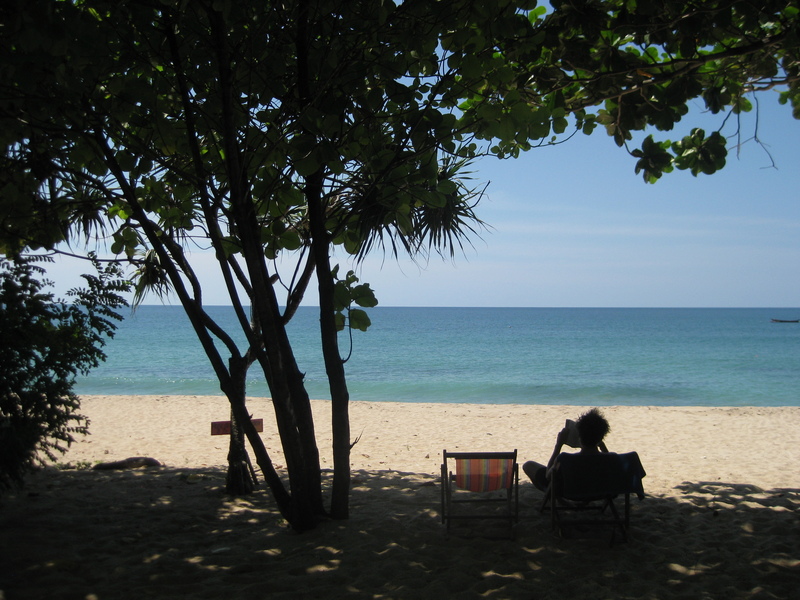 So if it’s a beach vacation you’re after, I don’t know that I’d recommend flying half way around the world (from Los Angeles or any other similarly situated locale) just to go to Ko Lanta. In my experience there are far better beaches to be had in the Caribbean and Hawaii. 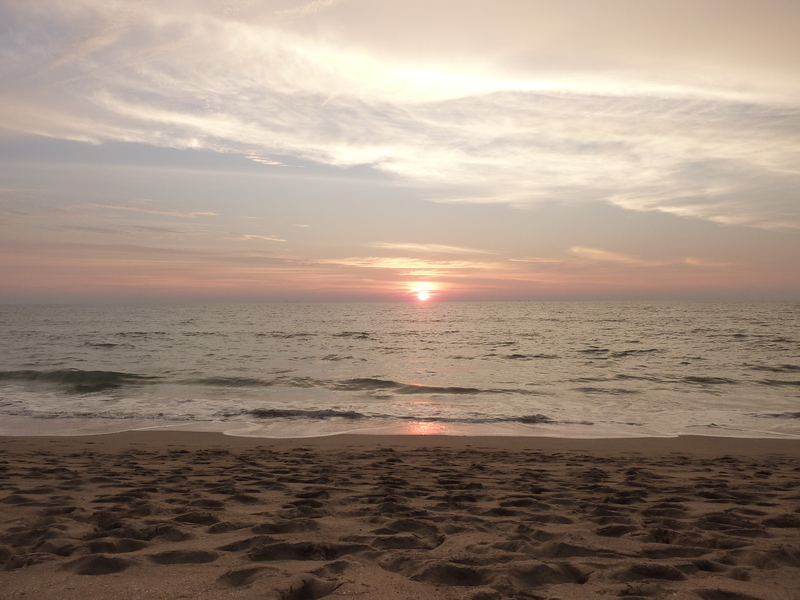 On the other hand, if you’re in Thailand and looking to incorporate some beach time into a longer trip, and you’re not planning to rage with the full moon party set, then you could certainly do worse than Ko Lanta. We spent our final afternoon together following in the footsteps of such literary luminaries as Joseph Conrad, Summerset Maugham, Graham Greene, John le Carre and Gore Vidal in visting La Grande Dame of Bangkok… the Oriental Hotel. 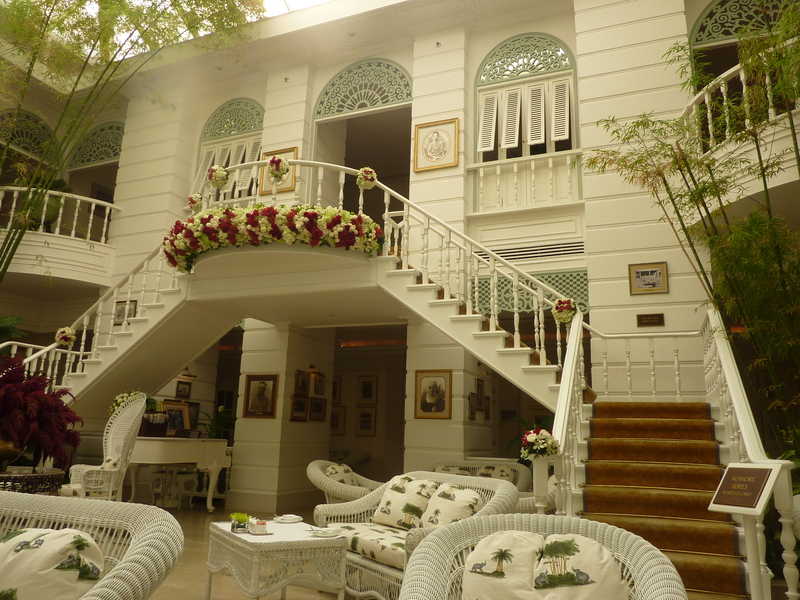 The Oriental is a gorgeous old hotel perched aside the Chao Phraya River and thus easily reachable via boat – the best way to get around in traffic strangled Bangkok. She’s been doing her thing for over 135 years and she’s undoubtedly charmed a great many guests in that time. Count as among the charmed. We vowed that were we ever to return to Bangkok with a billfold or purse bursting with baht, we’d be sure to spend some of it on a night or two at the Oriental. Fortunately we were in better shape upon our arrival than Somerset Maugham had been when he stumbled into the hotel in 1923 with a simmering case of malaria contracted somewhere along the way during his overland journey from Rangoon. It is said that after catching sight of Maugham sweating it out with a 105 degree fever, the manager asked a doctor to have Maugham removed as soon as possible for he felt that death was imminent and a death in his hotel would not be good for business. 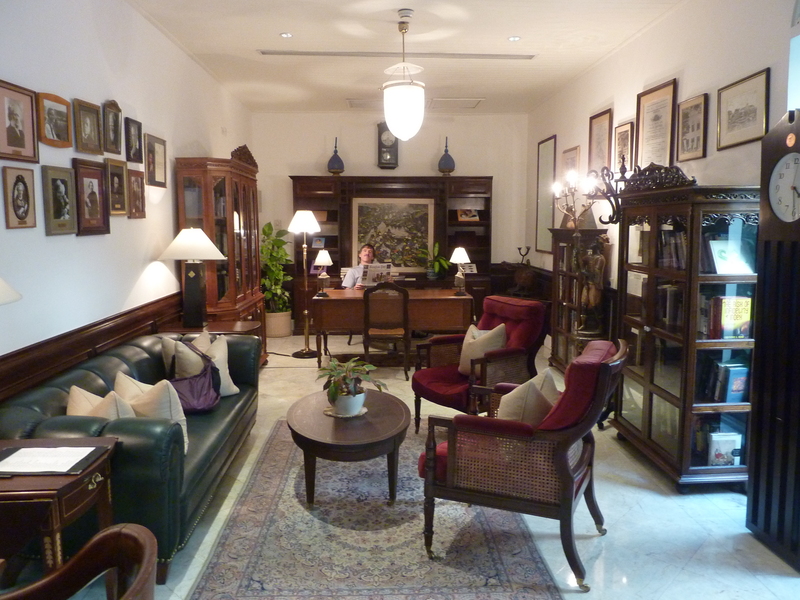 Fortunately for both, the writer recovered and went on to pen Gentleman in the Parlour: A Record of a Journey from Rangoon to Haiphong during his long convalescence at the hotel and with that the hotel’s reputation as a favorite of the literary set began. It’s reported that a stay at the hotel can cure writer’s block. We might not have had writer’s block, or malaria for that matter, but we were suffering from spot of thirst and a touch of hunger. We needed tea and proper snacks to accompany that tea and a classic venue with rattan furniture from which to enjoy our tea and snacks. And although we might not have known it in advance, it turned out that we most certainly also needed a moustachioed Spanish gentleman to gently strum upon his classical guitar from the balcony above as we sipped and snacked. And fortunately for us, the Author’s Lounge at the Oriental was able to deliver on all accounts. The scones with fresh butter were a revelation for two Yanks unaccustomed to the ways of British high tea and the clear MVPs of that formidable tower of snacking power. I know it’s not exactly the most Thai of experiences. 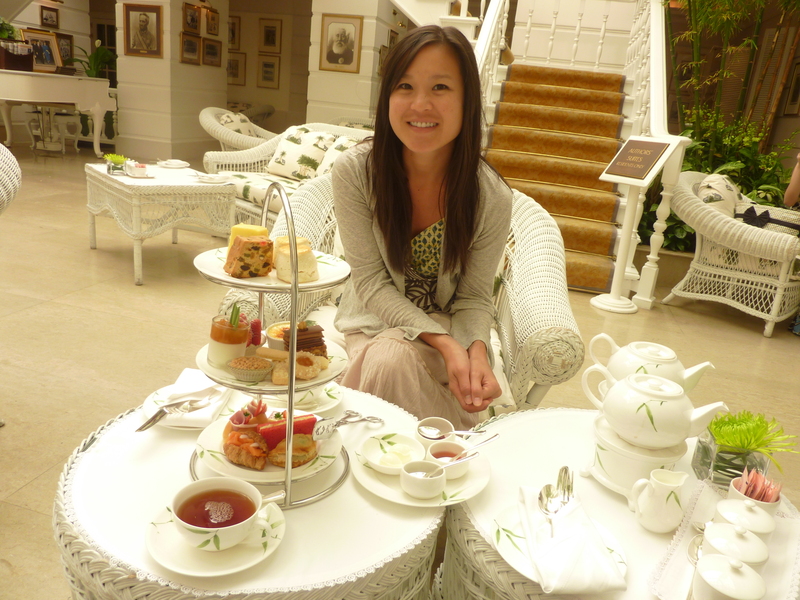 But taking high tea at the Author’s Lounge is a must in my book for any visitor to Bangkok with the means to do so. And with that Deandra was off to LA but not without first picking up a souvenir of her own in the form of some sort of Bangkokian intestinal malady that made the flight home a rather hellish affair – presumably both for her and whoever was unlucky enough to have clean up duty for, or be seated near, the aft lavatories on that flight. Light a match! Oh wait. It’s a plane. You can’t. As for me, well the final month of my six month jaunt beckoned and I’d be spending it in that magnificent riot of humanity known to some 1.241 billion people as Mother India.